Why reinvent the wheel? Pick pre-packaged templates from the store. 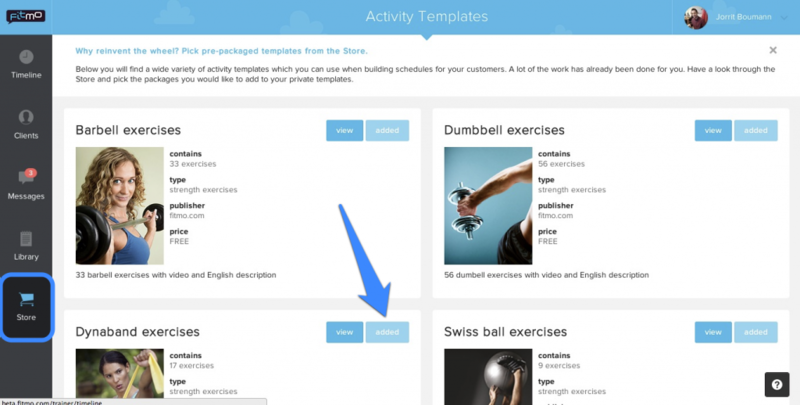 Here you will find a wide variety of activity templates which you can use when building schedules for your customer. A lot of the work has already been done for you. Have a look through the Store and pick the packages you would like to add to your private templates. Some packages are free of costs, Fitmo created them. Other packages are created by Fitmo users. For a small amount of money you can add these packages to your library. First select view, and if you like what you see select Add. The templates are in your library now, ready to be reused! Note: You can personalize each template how you like. Select the template and click on Edit.